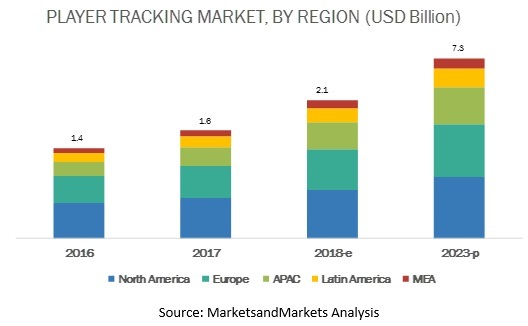 [112 Pages Report] MarketsandMarkets expects the global player tracking market size to grow from USD 2.1 billion in 2018 to USD 7.3 billion by 2023, at a Compound Annual Growth Rate (CAGR) of 27.8% during the forecast period. The major growth drivers of the market are increasing amount of on-field data and growing demand for real-time data access. The player tracking market has been segmented into solutions and services. The solutions segment is further segmented into wearables, optical, and application-based services. These solutions and services help players monitor various fitness-related parameters, such as heartbeat, speed, and distance. Additionally, these solutions help coaches and support staff in monitoring players to reduce any injury-related instances. Most of the high-speed games, such as soccer and rugby involve a lot of physical tackling as a result of which players get injured during live matches. With the help of player tracking solutions, coaches and support staffs can make informed decisions to prevent these injuries. These pros are attracting sports leagues, and teams to adopt player tracking solutions. Player tracking solution is considered one of the prerequisite components to keep an eye on the efficiency of a player. In recent years, player tracking solutions have gained a lot of traction particularly to monitor the efficiency level of players. The use of solutions to monitor day-to-day activities have become an integral part of sports training sessions. In this report, the player tracking solutions have been segmented into wearables, optical, and application-based solutions. The wearables segment is further segmented into smart glasses, smartwatches and fitness bands, and vests. Among solutions, the wearables segment is expected to have the highest market share, and the optical segment is projected to grow at the highest CAGR during the forecast period. With increasing awareness of fitness-related activities among people, the use of wearable fitness-tracking solutions has increased. On the basis of end user, the player tracking market has been segmented into individual sports and team sports. Individual sports are further segmented into golf, tennis, athletics, and others, whereas team sports are further segmented into soccer, hockey, cricket, basketball, and others. The adoption of player tracking solutions varies from segment to segment. The team sports segment is expected to lead the player tracking market with respect to the market share. Most of the wearable solutions, such as smart watches, fitness bands, and vests are used by an individual athlete, whereas optical solutions are mostly used in team sports as it requires large cameras to be installed in the stadium. Catapult and STATSports are some of the companies that offer player tracking solutions in both individual sports and team sports. 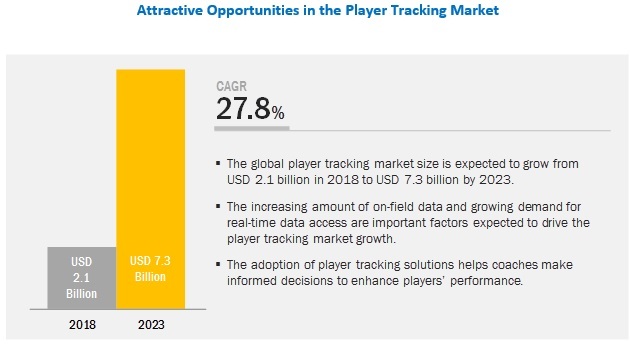 The geographical analysis of the player tracking market mainly categorizes into components, end users, and applications across 5 major regions, namely, North America, Europe, APAC, MEA, and Latin America. North America is an early adopter of technological solutions and associated services compared to other regions. The region has seen aggressive adoption of player tracking systems and solutions among players and teams, owing to the presence of developed economies in the region. The associations, such as National Basketball League (NBL), National Football League (NFL), and National Hockey League (NHL), are spending heavily on the advanced player tracking systems to analyze and track the player performance and health. Furthermore, it helps associations and team management in tracking fraudulent activities during the game. 15 major vendors offer player tracking solutions, platforms, and services across the globe; they are Zebra Technologies (US), Catapult Sports (Australia), STATSports (UK), ChyronHego (US), STATS (US), Kinexon (Germany), Polar (Finland), Playgineering (Latvia), Sonda Sports (Poland), JOHAN Sports (Netherlands), Exelio (US), Q-Track (US), Advanced sports analytics (US), Xampion (Finland), Sports Performance Tracking (Australia). In March 2019, STATS launched AutoSTATS, the first AI and computer vision technology, to deliver comprehensive player-tracking data through any broadcast. In February 2019, STATSports collaborated with the Socceroos, Australia’s national soccer team. Under this partnership, STATSports would provide Apex tracking device to Australia’s national soccer team to measure distance, speed, acceleration, deceleration, high-speed running, load, and heart rate. In January 2019, Catapult Sports partnered with Federation Francaise de Football (FFF), current FIFA world champion (France). Under this collaboration, 100 Catapult athlete monitoring devices will be used by the FFF national teams. In August 2017, Catapult Sports acquired the SportsMed Elite and Baseline Athlete Management System (AMS) products from Brisbane based SMG Technologies. What are the major challenges faced by vendors while selling player tracking solutions? What are the drivers for the adoption of player tracking solutions among different regions? Who are the major players in the player tracking market? What are different growth trends in the player tracking market? The study involved 4 major activities in estimating the current market size for the player tracking market. Exhaustive secondary research was done to collect information on the player tracking solutions, adoptions, and market trends. The next step was to validate these findings, assumptions, and sizing with industry experts across the value chain using primary research. Both top-down and bottom-up approaches were employed to estimate the complete market size. Thereafter, the market breakup and data triangulation procedures were used to estimate the market size of the segments and sub-segments of the player tracking market. In the secondary research process, various secondary sources, such as D&B Hoovers, Bloomberg BusinessWeek, and Factiva have been referred to, to identify and collect information for this study. These secondary sources included annual reports, press releases, and investor presentations of companies, whitepapers, certified publications and articles by recognized authors, gold standard and silver standard websites, regulatory bodies, trade directories, and databases. After arriving at the overall market size using the market size estimation processes as explained above, the market was split into several segments and subsegments. To complete the overall market engineering process and arrive at the exact statistics of each market segment and subsegment, the data triangulation, and market breakup procedures were employed, wherever applicable. The data was triangulated by studying various factors and trends from both, the demand and supply sides. It includes 15 major vendors, namely, Catapult (Australia), STATSports (UK), Zebra Technologies (US), ChyronHego Corporation (US), Polar (Finland), STATS LLC (US), JOHAN Sports (Netherlands), Sonda Sports (Poland), Xampion (Finland), Kinexon (Germany), Advanced Sports Analytics (US), Sports Performance Tracking (Australia), Q-Track (US), PlayGineering (Latvia), and Exelio (Italy).